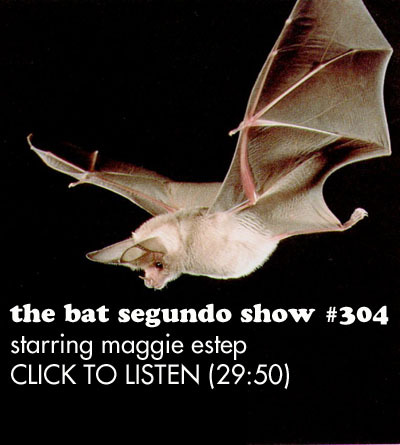 Maggie Estep appeared on The Bat Segundo Show #304. 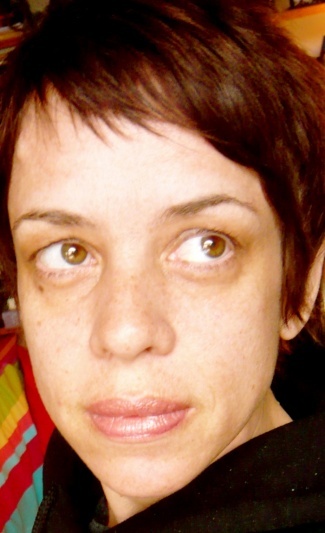 Maggie Estep is most recently the author of Alice Fantastic. Condition of Mr. Segundo: Hoping to see Alice at the next opportunity. Subjects Discussed: Efforts to determine if it’s good to be happy, animals throughout Estep’s work, how love for animals is directly proportional to love for human beings, Of Mice and Men, literary allusions, “The Rocking Horse Winner,” women who are described as tiny, the reverse symmetry of characters being kicked out of bed, mother figures, manuscript revision and cleavers, the difficulties of writing something in 1872, being accused of deliberately being shocking, idioms that pop up in lines, “take a raincheck” as a generational cliche, fantastical survival systems, the ethics of plucking from real life, getting bogged down in the minutiae, living in the Lower East Side in the 1980s, characters with brown hair, being dismissive of blonde people, Uma Thurman, people carrying gingerbread houses, Rikers Island, getting procedures right, nothing but raw chicken necks in the fridge, the naming criteria for 17 dogs, Ira from Yo La Tengo, people who were mad at Estep’s first book, asking permission from lifting life experience, Estep’s horse racing experience, soundtracks that are more musical than fingers on a chalkboard, internal rhyme, Estep’s spoken word background, vomiting as a MacGuffin, being mildly clumsy, vacation, and quirky translation. Estep: “Our love of animals is directly proportionate to our indifference to human beings.” It’s a little bit of an exaggeration. I grew up around all sorts of horses and cats and dogs. To this day, my mom — if I want to get her talking to me for more than two minutes — it has to be about the dogs. So it’s an off-the-nose dialogue where we’re talking about the dogs. But really we’re talking about something else. Correspondent: Interesting. And in this, you are talking about something else with the dogs. Because from the very beginning, the big oaf with the puppy and all this reminded me very much of Lennie from Of Mice and Men, among many other literary allusions. First of all, I want to ask if some of these literary allusions that are there — “The Rocking Horse Winner,” for example — were these intentional or were these just part of the whole…? Estep: It’s never, never deliberate. It’s all there swimming around in my little brain and comes out inadvertently sometimes. Correspondent: Little brain. I wanted to ask you about littleness. Because one thing that is very curious is that many of the women in this book are described as tiny. Correspondent: You have the tiny goth girl waitress. And Eloise is described as tiny by her mother. And, of course, Kimberly is described as tiny. And then, of course, there’s Tina in this. Tiny. Tina. Correspondent: I’m getting a little theme here that most of the women in this book are tiny. And I’m curious as to why this is. What is it with this modifier here? Estep: I actually had not really thought of that. (laughs) I don’t know. But Alice, who is sort of the main one, is not tiny. She’s rangy. I don’t know. There’s something about small women who are very tough that’s really a beautiful prototype. And until you pointed it out, I didn’t realize that’s what was going on in the book. Correspondent: There’s an inverse ratio between height and toughness in your mind? Correspondent: Is that your theory? Estep: Maybe. That might be something. Correspondent: Okay. Did you develop this theory over the course of time? Or did it just apply to the particular universe of this novel?